History teaching in the UK has been in the news recently with a report from the All-Party Parliamentary Group on History and Archives last month and education minister (and disaster) Michael Gove giving his opinions, including the view that Mary Seacole should be dropped from the national curriculum so history teachers can concentrate on Winston Churchill and Oliver Cromwell in what has been described as ‘air-brushing black people out of history‘. 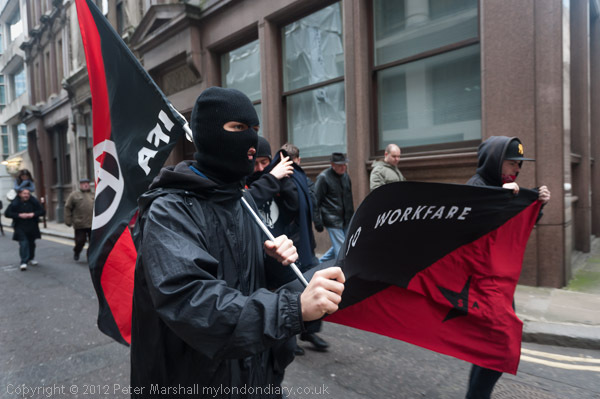 Many other events have also been air-brushed out of our history in the past, and although so far as I know all those taking part were white, I doubt if Thomas Venner‘s brief and doomed insurrection of 1661 will be a part of the Tory history agenda. The whole story of the ‘Fifth Monarchists’ is an intriguing one, and one I give a little background in my introduction to the pictures in Epiphany Rising Against King, and to understand it requires thinking in a very different frame of reference to our own age. Religion was at the very centre and everything was seen through a glass that seems unnatural to us now, although there are perhaps parallels in some current movements. But the story of our English revolution is largely seen (and was perhaps taught) as some kind of aberration, with everyone giving a sigh of relief when the monarchy was restored to its rightful place, and Venner serves as a reminder that not everyone felt that way. 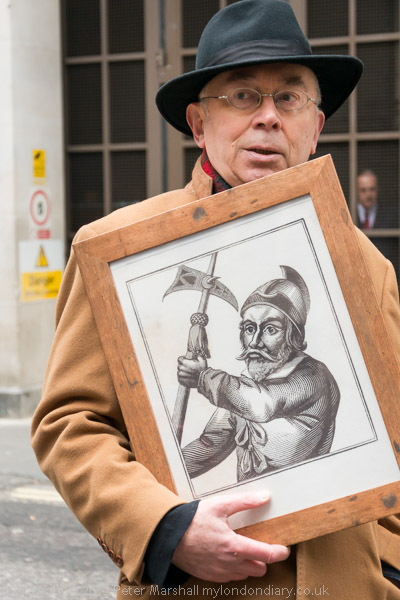 As well as the ‘jehadists’ of the Fifth Monarchy, there were also the Muggletonians founded in 1661, and represented at the event by Sam Johnson, the grandson of Philip Sidney Noakes, the last of the Muggletonians who died in 1979 leaving the papers of the group to the British Library. Like the Fifth Monarchists they were egalitarians, like them basing their ideas on biblical sources, but beautifully and deliberately disorganised and crucially pacifist. 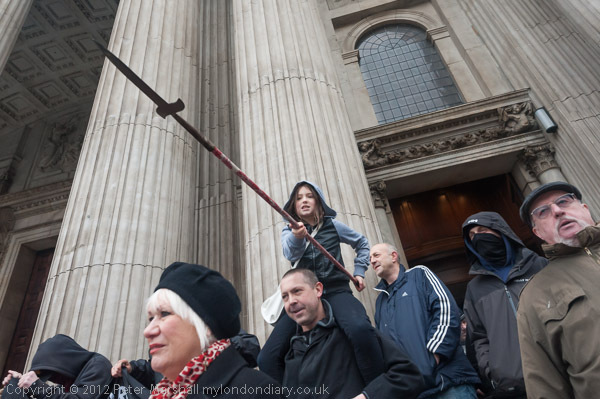 Which added at least a little amusement for me when Sam’s daughter Rachel was the one flourishing the pike on the steps of St Paul’s Cathedral. Venner’s revolt against monarchy was of course cruelly suppressed, and our ‘reconstruction’ for a film began on the site of his congregation, where he and others were hung, drawn and quartered. The same fate was meted out to some other sympathisers who had not taken part in the violent events of the first few days of 1661, and repressive laws were passed to outlaw dissenters and dissent. This entry was posted on Friday, January 11th, 2013 at 11:30 am and is filed under My Own Work, Political Issues. You can follow any responses to this entry through the RSS 2.0 feed. You can leave a response, or trackback from your own site.